As power is relative to weight, KTM engineers have worked tirelessly to produce an engine with class-leading power and the lowest weight in the MX2 category. The end result is a motorcycle that sets the class benchmark for power-to-weight ratio and is the strongest in MX2 competition. With many updates, including valve timing, exhaust, airbox and EMS (engine management system), the power unit produces more torque and power across the entire rev range than ever before. Its compact architecture contributes to excellent mass centralization, which supports the easy rideability of the bike. In short, the combination of a compact engine layout and unrivalled power makes the new KTM 250 SX-F an undisputed winner once again. ENGINE The engine of the KTM 350 SX-F features a compact and very light (60lbs) construction. Its DOHC (double overheard camshaft) design with lightweight titanium valves and DLC coated cam followers allows for lively but strong engine characteristics. Fitted with the latest electronic fuel injection system and an E-starter, it has an extremely wide usable speed range, high performance and incredibly efficient rideability. The KTM 350 SX-F engine shares the same layout as the 250 SX-F, resulting in its playful handling similar to a 250 machine by from reducing the moving masses to a minimum. CYLINDER HEAD The centerpiece of the compact DOHC engine is the cutting-edge cylinder head. It features two overhead camshafts, which activate the titanium valves via super-light finger followers with a hard DLC coating. New lateral brackets (now made of aluminum instead of steel) allow an efficient fixation of the engine to the frame and shave off even more weight. CRANKSHAFT The 250 SX-F has an extremely rigid crankshaft, which features a connecting rod with a plain big end bearing with two force-fitted bearing shells running directly on the crank pin. This design is a major prerequisite for the extremely high engine speed levels and the unrivaled maximum power of the 250cc engine. Not only that, it enhances the engine’s durability, allowing long crankshaft service intervals, which is a huge customer benefit in relation to time, effort and cost. CRANKCASES AND ENGINE COVERS The design of the die-cast engine cases allows for minimal weight and a very centralized shaft configuration. This makes the engine short and compact, while contributing to an efficient centralization of masses. The engine covers also feature a solid surface structure, which reduces the wear caused by the rider’s boots. This way, your SX-F will keep looking better longer. TRANSMISSION The reliable 5-speed transmission features a special surface treatment on the 2nd, 3rd and 4th gears for solid reliability. The advanced ´No Dirt´ gear shift lever design prevents dirt from jamming the joint of the lever and guarantees precise shifting even in the muddiest conditions. All 4-stroke SX-F engines are fitted with a gear position sensor for tailored engine mapping for each gear. For 2018, the transmission shaft gets a new C4 bearing that has a bigger overlap in the case. This means reliability even under extremely hard conditions. ENGINE MANAGEMENT SYSTEM The state-of-the-art Keihin Engine Management System with electronic fuel injection features a 44mm throttle body. Thanks to its unique injector position, the engine’s response is instantaneous. And to make life even easier, separate systems for cold starts and idle adjustment await you. The lightweight ECU features a unique traction and launch control system for lightning-quick response when the gate drops and maximum grip thanks to different maps that sync with to the gear you’re in. It’s also possible to unleash an even more powerful mapping via the handlebar map switch. CYLINDER AND PISTON Inside the short cylinder, with a bore of 78mm, thumps a box-type piston made by CP. Its crown geometry is adapted perfectly to the high-compression combustion chamber (14:1), where its rigid structure and low weight shine. Thanks to the low oscillating masses, the engine is snappy as it is strong. BALANCER SHAFT The side-mounted counter balancer does double duty also driving the water pump. Thanks to its perfect balance and low oscillating masses, engine vibration is kept to a minimum. CLUTCH The KTM 250 SX-F employs the KTM-developed CSS clutch (coil spring steel) with a robust steel basket and extremely heat resistant clutch plates and new, nitrated steel liners reducing the wear. Light operation and telepathic amounts of control are standard with this hydraulic Brembo actuated clutch. E-STARTER Like all KTM 4-stroke motorcycles, the 450 SX-F is started at the push of a button - a priceless advantage when you’re on the clock. HANDLEBAR MAP SELECT SWITCH All 4-stroke models are equipped with a multi-functional handlebar map select switch, which does three things:Activation of the traction controlActivation of the launch controlSelection of two power curves (Standard or Advanced)The traction control is a unique feature that none of the competitors can offer. It guarantees more efficient traction when the track conditions are less than perfect. Push the button and reign supreme. With this map select switch the rider can also activate the launch control, which provides more efficient starts out of the gate so you can go for the holeshot, time and time again. How? It simply reduces the maximum engine speed for the very first moments of the start, in order to give you better control. Push both buttons when the engine idles and the EFI control lamp mounted on the upper triple clamp will let you know you are READY TO RACE. In addition, the map select switch gives the rider the chance to select an alternative, more powerful map beside the standard configuration. Welcome to the future. COOLING KTM’s proven cooling system routes the coolant from the cylinder head through the frame triangle, directly to aluminum radiators made by WP. A new filler cap system and are stiffer alloy construction increase the durability and reliability of the cooling system. Due to flow optimized internal circulation and CFD-calculated air ventilation, the system is superbly efficient. In addition, well thought-out radiator guards integrated in the front part of the shrouds provide protection in a crash. EXHAUST Noise limits are a real challenge for every manufacturer. Therefore, KTM has put a lot of effort into the development of its exhaust systems. All 4-strokes are fitted with header pipes that have a unique standard feature; an additional resonator system – a small chamber connected to the pipe. All 4-strokes are fitted with a short silencer, mounted as close to the engine as possible for mass centralization and better rideability. Its advanced internal design reduces the noise sufficiently in order to sit safely below noise limits while still raising the hairs on your neck. Every rider knows that when the feeling on the bike is good, the ride is awesome. The chassis forms an integral part of this "feeling" and has been designed to provide accurate feedback between track and rider, while also reducing the harshness of typical motocross terrain. The KTM 250 SX-F features a new lightweight, high-tech steel frame that not only provides a great feeling, but has been optimized for more accurate rider feedback. The new flex characteristics provide excellent agility and high-speed stability, contributing to an intuitive ride like no other. FRAME The high-tech, lightweight chrome-moly steel frame has a knack for easy handling, outlandish rideability, precise cornering and excellent stability. You can also count on high torsional rigidity and low longitudinal stiffness. This results in better absorption of the energy created from the front and rear suspension, sucking up jumps and bumps. In short: more comfort and less rider fatigue. Laterally attached, lightweight aluminum engine head stays (the connection between cylinder head and frame) contribute to more precise cornering and a reduced vibration level. The engineers were able to pull off all that, while making their frame 2.2 pounds lighter than that of the lightest competitor on the market. In addition, it is easier to maintain, easier to work on and supplies more space for the tank and other components. The bike also features an extra-light subframe made of aluminum, which tips the scales at less than 2 pounds. FRONT SUSPENSION All full-size SX models are fitted with the super-lightweight WP AER 48 front fork. It is a 48 mm USD air-sprung fork with separate functions for each fork leg, meaning damping functions are on the right side and the air spring is on the left. The left leg features a two-chamber system with a capsuled air cartridge, helping prevent loss of air pressure. Essentially, this means that in the rare case of a leaking outer seal, the internal cartridge pressure keeps the bike in a normal position. The air spring is exceptionally easy to use and can be adjusted to any rider weight via a single air valve and the air pump that is supplied with the bike. The right fork leg integrates a damping cartridge to fit single damping leg requirements and can be adjusted to the track conditions and the rider's preferences. (compression from top, rebound from bottom, 30 clicks each). For 2019, new settings on the damping side have improved the damping characteristics, providing great front end feel and control. HANDLEBAR KTM engineers sure know how to handle handlebars. This tapered unit, made of high-strength aluminum, is fixed in damped rubber mounts and has two different positions. ODI lock-on grips make grip changes easy and do not require any wire or glue to be secured. FOOTPEGS Sophisticated ´No Dirt´ footpegs prevent clogging of the footpeg pivot, even when digging in deep ruts. Looking for a higher riding position? Then just mount the footpegs of the 2018 EXC models, which are 6mm higher than the SX versions. KTM's 4-stroke motocross bikes are the industry benchmark when it comes to innovative technology and styling. With input from KTM's factory riders, as well as KTM R&D and Kiska Design, the new bodywork of the KTM 250 SX-F pushes the boundaries of progression even further. The result is a shape that achieves complete harmony between rider and bike and features across the entire SX range. The main goal was to provide the optimal contact points that allow a rider maximum freedom of movement and improved handling. The front and rear fenders feature an intelligent I-beam design, guaranteeing maximum stability with the lowest possible weight. The new graphics add to the fast and aggressive style of the bike and also confirms KTM's never-ending quest for race-winning progression. DECALS New graphics convey the READY TO RACE character of the 2019 SX-F model line. 4-strokes have defined the modern era of motocross and KTM have used the SX-F range to push the boundaries of innovation. To stay ahead in the competitive MX2 class, KTM equipped the 250 SX-F with a multifunctional handlebar map switch. The unit activates innovative features like traction control, launch control and even alternative power curves. KTM's engineers have pushed performance to the extreme, making electronics a necessary progression that ensures power is delivered in the most effective way. 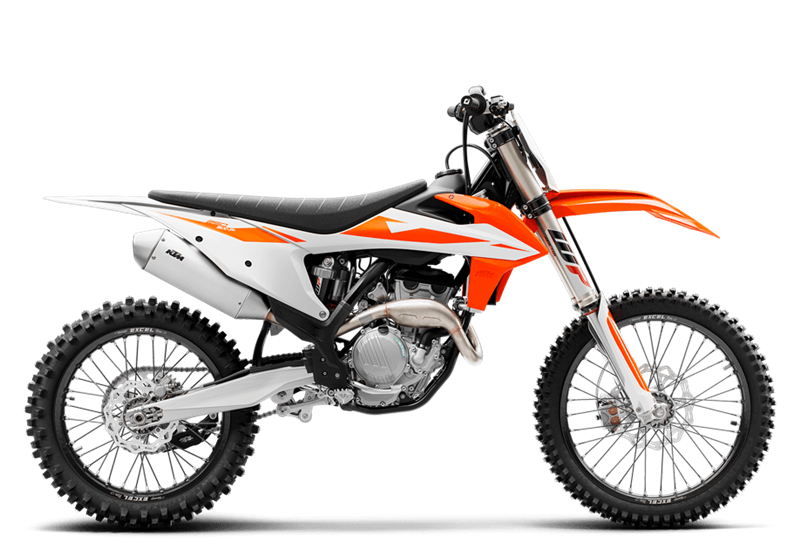 KTM SX-F models also feature other unique advantages, like the proven electric starter. Now, more than ever, READY TO RACE performance is just the push of a button away. BATTERY & WIRING HARNESS A strong new lithium ion battery breathes life into the engine and contributes to low vehicle weight. The lightweight battery and wiring harness are centralized in a compartment above the air filter box, allowing the mechanic to remove the subframe without moving the electronics. A happy mechanic is a good mechanic.